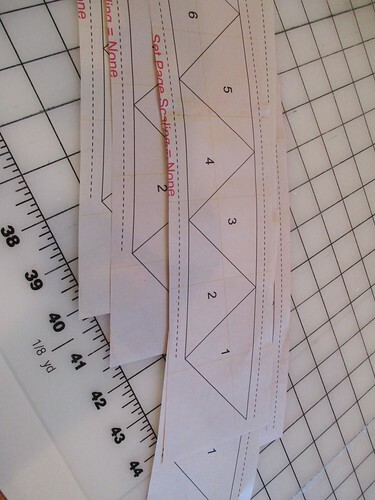 For September our assignment is to set in nine red triangle-like shapes to make the top a circle and then sew on a paper pieced ring of triangles. 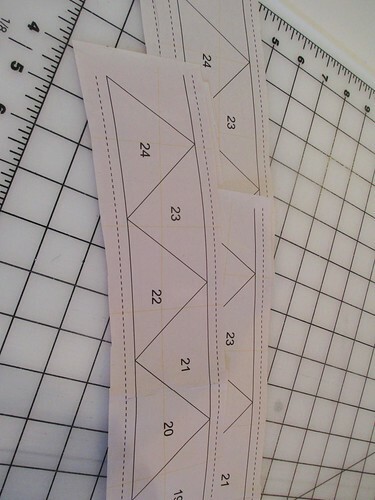 There are six of these 24 piece sections to be paper pieced and sewn together into a ring. The ring is going to be very large! The ring will be sewn onto the top in the last step for this month. WOW it looks awesome. Jenny threw up on mine this morning ! ! ! ! Thankfully she hit an outside block, so it need be, it can be replaced. Oh my goodness! All that work! 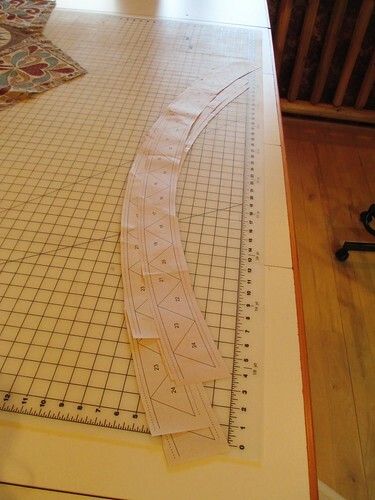 I think you are using the Buttons & Bows fabric, right? 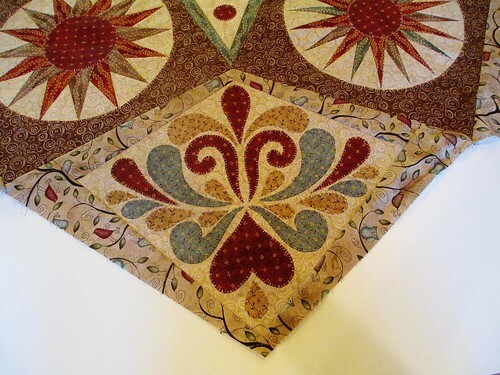 I like it quite a bit better now that I see it close up in your quilt. It’s going to be really nice. 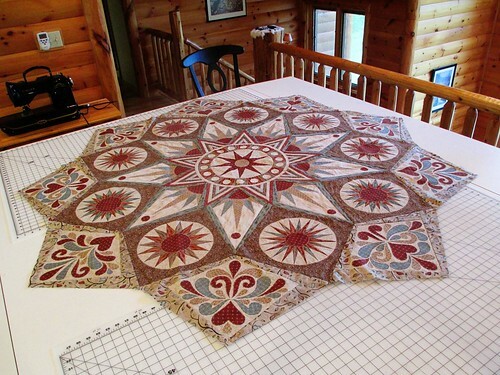 My Sedona Star is on hiatus until I finish a few other projects. I’ve learned that I would prefer to read all the instructions for the whole year in advance, rather than the drip, drip, drip of a little every month. 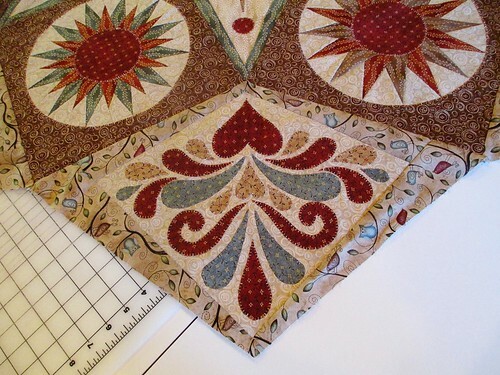 Yes, I am using “Buttons and Blooms.” I think the fabrics are beautiful, but I would like to pick my own and do this quilt again. I guess I have to add it to my stack of want-to-do’s! OMG!!! 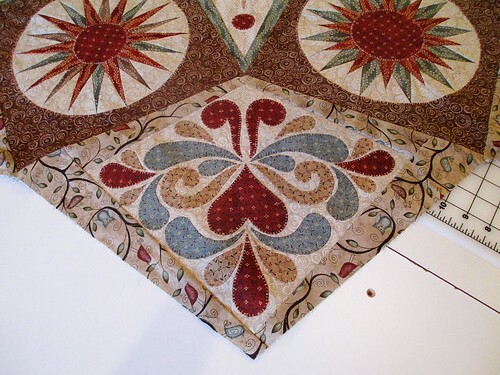 This quilt is exquisite!! !